Congratulations on finishing London Calling. I can’t wait to read it. I sometimes think time speeds up when we get into a routine. Because we know it so well, we stop taking notice. Perhaps the secret of feeling time pass is to keep doing new, challenging things and thinking differently. I hope you have a lovely Christmas and New Year. Thank you! Yes, I think you are right, must do more exciting things next year!!! Happy Christmas! Thanks for the reblog. Happy Christmas! If London Calling only takes us to Christmas 1943 I sure hope you’re already working on the next one!! Yes, indeed! I am already thinking about the next one, major research starting after Christmas! Thank you for your sweet Snoopy card, Helen. 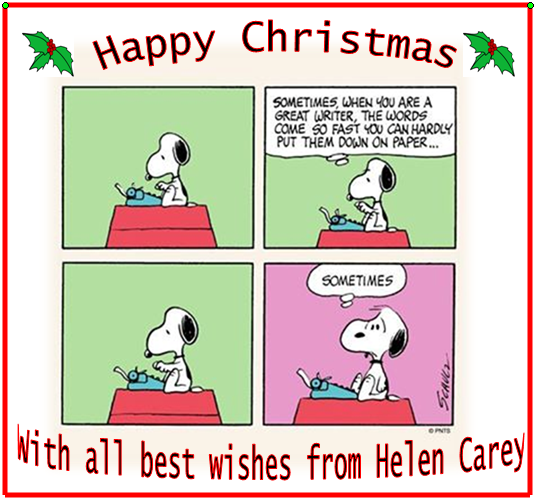 I wish you a very happy Christmas and will look forward to reading “London Calling” in 2015. All good wishes – Jean. Glad you liked the card! Thank you so much for your support – so much appreciated. Happy Christmas. So happy the book is ready to go. Can’t wait! Merry Christmas and a happy New Year to you and yours. Thank you – I just hope it’s worth the wait!! Happy Christmas. Well shucks 😂- I was hoping to get your new novel in my Chrismas stocking! Ah well, there’s hope for something good in the new year at least! Can’t wait! Ha! Well I’m sure there will be other lovely things in your Christmas stocking! !